Give this beautiful Engraved Picture Frame Grandma on Mother’s Day, her Birthday, Valentine’s Day or any special occasion. Add her favorite photo to this Engraved Glass Picture Frame to make it a unique keepsake she’ll cherish each and every day. 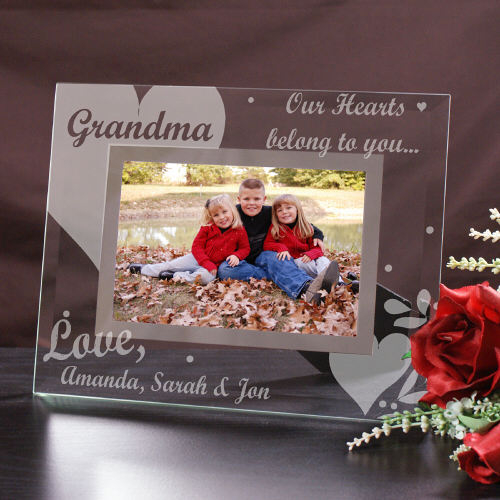 This Engraved Glass Picture Frame comes in two great sizes. Choose either our 9" x 7" frame that holds a 3.5" x 5" or 4" x 6" photo or our 8" x 10" frame that holds a 5" x 7" photo. Easel back allows for desk display. Grandma's Picture Frame includes FREE personalization! Makes great Gift for Grandma anytime of the year. Our Personalized Picture Frame can be personalized with any title like Mom, Grandma, Nana or any thing you like and up to 12 children's names. very nice product, however one of the frames I ordered was engraved too high on the frame and cut off the tops of the letters. Very disappointing since this was a gift. Additional Details Mother’s Day is a lovely time of year to give your Mom, Grandma, Aunt, Girlfriend or Best Friend an Engraved Mother's Day Gift from GiftsForYouNow, and even special personalized gifts for Grandma!